It is currently Fri Apr 19, 2019 8:26 pm. Even behind a locked door, you can still be damaged and killed by players while you are in your home and they are outside of it. The Earthquake spell has a range of 8 tiles, and can reach any player in any house at any time. The two exceptions would be while in a castle or keep which has "secure" courtyards (i.e. no one has a rune to recall there). These are, for all practical purposes, non-existent. Meteor Swarm and Chain Lightning are, for all practical purposes, the same spell. So let's use MS as an example since it's reagent cost is lower. These spells will damage all characters and NPCs on the tile they target, plus a two-tile radius in each direction. This makes them hit a 3x3 space. Like most spells, they also do absolute damage, not a percentage of health, so they can kill you directly. 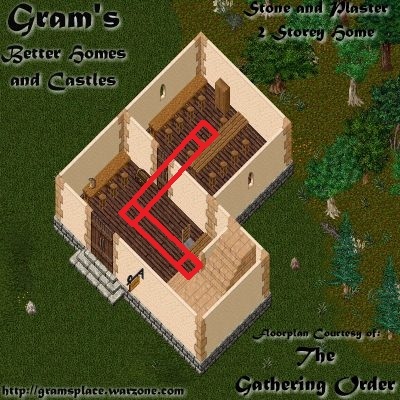 Lastly, we have the three "fortress" homes. Despite their names, they have recently become the least safe homes in Brittania. Due to an era-accurate "bug", players can target spells on the ground inside these houses. (This is accomplished via either a circle of transparency in the Options, or a "relative target" in Razor). Paradoxically, as the player backs away from a house, they can target spots under the foundation further and further towards the inside of the home. What this means is that, assuming courtyards are compromised, there are no safe places from Meteor Swarm within these houses! 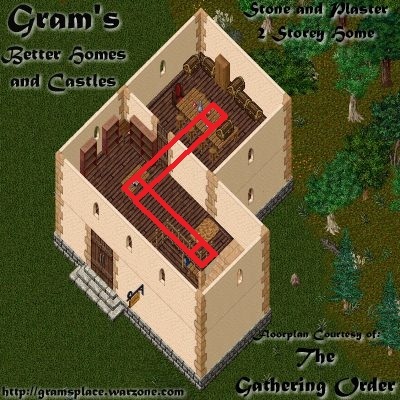 In some instances, the geography surrounding one of these houses would prevent a player from backing away far enough to see deep inside, and so some tiles may be safe. These fortresses also create vulnerabilities in *other* houses as well. 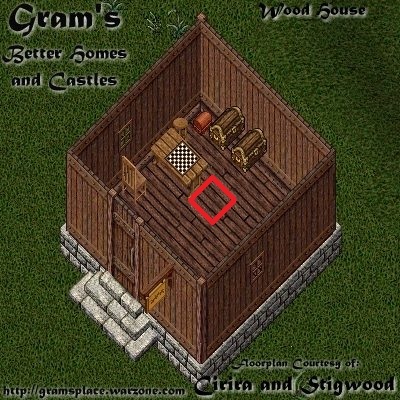 Due to the height one can reach on a tower wing or keep/castle turret (and/or by climbing a footstool stairway on such a house), you can potentially have line-of-sight on the roof of nearby houses. This means you can target a point on the roof towards the middle of the house... in which case, since Meteor Swarm damages all mobiles on tiles regardless of height, you can damage people under the roof within the house. It is almost impossible to predict the LOS your neighbor will have from their tower/keep/castle to your nearby brick/patio/2-story, so it would be wise to befriend them and try to see for yourself... or befriend them in hopes they never climb up and drop Meteor Swarms on your roof Alternatively, you could buy up any tall homes in the vicinity, or choose a home that has no big homes nearby it. I will attempt to take screenshots within some of these houses, in order to better illustrate the safety zones (my Paint skills are awful, so if anyone wishes to supply screenshots for me, they're welcome to as well). Please feel free to comment below if you have any corrections to my statements above (I haven't tested this as extensively as some of you have, so please let me know if something is missing or incorrect). You are not safe on the patio. Good to know. Can you elaborate? Would like to include reasoning in the guide. Thanks. I've posted this in a few threads, but since you've put the effort in to write this here I thought I'd add: it's possible (and can be timed) to kill someone macroing magery on themselves by using the earthquake spell, even with the 100% health check. Macroing magery on yourself in a small wasn't safe before the LoS issues and it still isn't - don't do this on a stat character. Due to an era-accurate "bug", players can target spells on the ground inside these houses. So, at what point did OSI shards fix this, then? In the wiki it says that any house with a stone foundation, but this isn't what's stated here. It says towers, keeps, and castles have no safe spots, but others do, what about non-stone foundation houses. And..............what about using items to block line of sight like ovens, I'm told this will stop spells, but not throwing potions (through the outside wall??) into your house. Due to an era-accurate "bug", players can target spells on the ground inside these houses. (This is accomplished via either a circle of transparency in the Options, or a "relative target" in Razor). 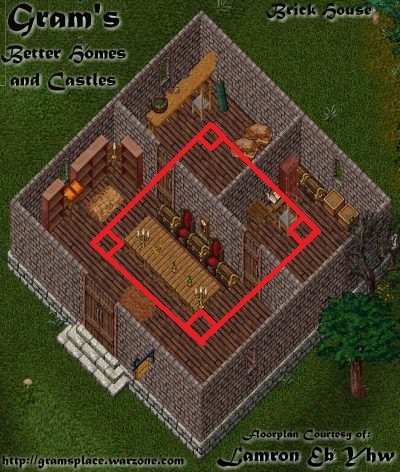 the wiki says that it's possible to have unlimited (well, not unlimited but up the max range) range on any house with a stone foundation, not just the tower, keep and castle, is this not the case? Because ALL of the houses on this shard have a stone foundation. 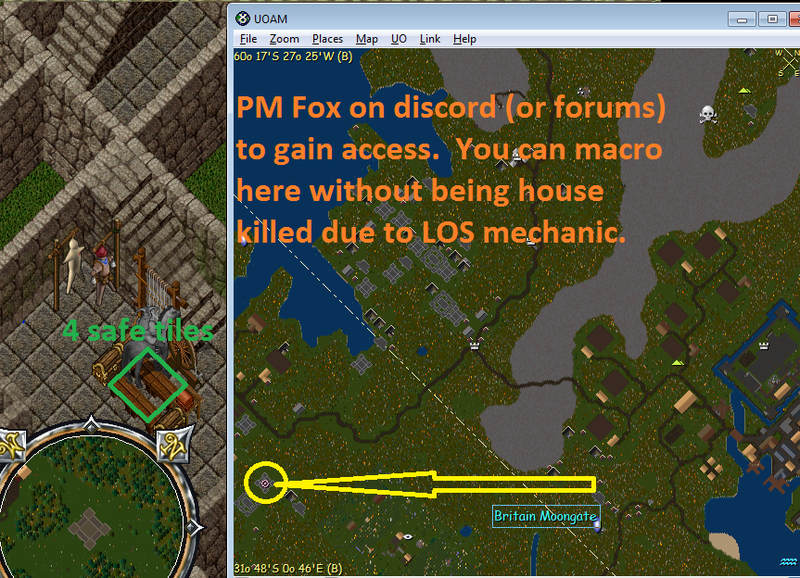 PM Fox on discord (or Forums) to gain access. You can macro here without being house killed due to the LOS mechanic.